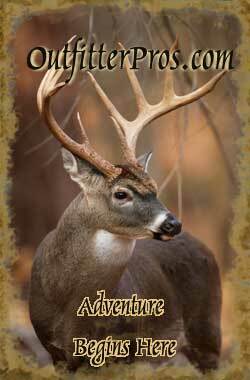 Find and Book a Hunting Trip with Professional, Pre-Screened Ohio Hunting Guides / Outfitters. Trophy Whitetail Deer and wild Turkey top the list of the most sought after game in the Buckeye State. We'll help you find a professional Ohio Hunting Guide / Outfitter for your next hunt, simply click Find A Hunt or select a gun or bow below after reviewing the Ohio Hunting information. Whitetail deer hunting in The Buckeye State is world class and is gaining fame as a trophy buck state due in large part to having an excellent deer management program. The state's deer management program has a very conservative buck harvest and is designed to manage for trophy-sized bucks while controlling the state population through hunting of deer, especially does. This allows for the population to remain balanced while also putting in place the conditions necessary to produce record setting deer. Ohio has a short gun season, held after the rut (which is bow hunting only) and only allows shotguns. Other top hunting choices in the Buckeye State include abundant eastern wild turkey, bobwhite quail, coyote, duck, and goose. Ohio Hunts Select the desired species & weapon below and click "Go"